Developing a team identity is crucial for competition. 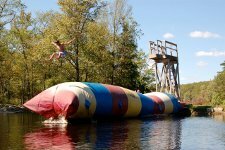 At Team USA Sports Camp we provide an environment that truly fosters team building. Athletes interact with teammates in different and powerful ways as they live and train together during their stay. Our team challenge programs go even further to strengthen team dynamics. With the guidance of our trained staff, team challenge programs help team members gain valuable insights throughout the day while their safety is closely monitored. By testing individual limits, athletes overcome personal fears and develop new confidence. The courses are designed to remind athletes of the importance of teamwork, learn to trust one another and teach problem-solving and decision making skills. When athletes engage in mental as well as physical challenges, they evolve beyond their current level of performance. As they embrace the challenge and push their limits they are better able to realize their full potential. The result is athletes demonstate improved coordination, self-esteem and confidence. Coaches see increased team morale through shared successes and performance breakthroughs. As teams strategize and collaborate together, their shared accomplishments bring them closer and increase their trust and commitment to one another.